Thakur Gulab Singh, Public Works Minister said that the State Government was spending an amount of Rs 2052 crore during the current financial year on maintenance and construction of roads and bridges in the State, which was 15 per cent more than the amount spent during the pervious year. Minister said it in a review meeting of the progress in periodic renewal of all National Highways and major roads in the State. Thakur Gulab Singh said that a target of renewal tarring of 1450 kms roads had been fixed for the current financial year, out of which over 260 kms., road length have been provided with renewal coating. He said that during the present tenure of the Government 3605 kms new motorable roads and 260 bridges had been constructed besides cross drainage had been provided on 6006 kms. road length. 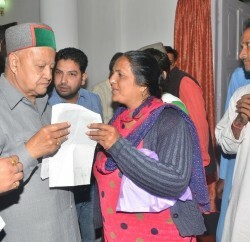 He said that 6012 kms roads had been provided renewal tarring and 1020 villages had been connected with the motorable roads. Public Works Minister said that the State Government was providing high priority to the development and maintenance of roads in the State, as roads were a vital infrastructure for economic growth of the State. He said that development of important sectors such as Agriculture, Horticulture, Industries, and Forestry etc. depends upon efficient road network. He directed the officers of the Department to ensure proper upkeep and maintenance of roads for making the journey in the State a commuters’ delight. Public Works Minister said that today the State can boast of having road density of 58 kms. per 100 sq. kms., which is the highest amongst the hilly States of the country. 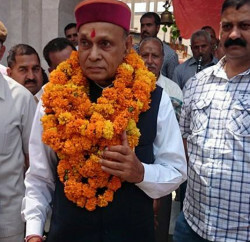 He said that the credit of this goes to visionary leadership of Prof. Prem Kumar Dhumal, Chief Minister who had accorded top most priority to the roads. He said that today 3000 panchayats, out of total 3243 panchayats stands connected by roads and the State have a strong network of 32410 kms of roads. He said that during this period 443 schemes worth Rs. 1051 crore had been approved under NABARD besides 389 road projects worth Rs. 523 crore had been approved under PMGSY for the State. He said that said that the State Government had taken a decision to construct concrete roads in mushy areas to facilitate commuters besides providing more durable roads. He said that concrete roads are being constructed at places where ground water table is high or road passes through slushy reaches and through densely populated area so as to ensure longevity of roads and convenience to the commuters. So far, 12 kms concrete roads have been constructed in different parts of the State. Public Works Minister said that over 64,000 drums of bitumen was procured and provided to the respective zones to ensure that tarring work does not suffer for want of bitumen. He said that the State has pioneered in using bitumen emulsion, instead of normal paving bitumen during winter and rainy season. He directed the Zonal Chief Engineers to ensure that target set for tarring was achieved within the stipulated time period. He said that it should also be ensured that high quality bitumen was used for longevity of roads. J.C. Sharma, Secretary, Public Works Department presented vote of thanks. He said that the department would be contemplating to procure machine for each zone for patch work. He said that this would also help in expediting quality tarring works. Nand Lal Sharma, Engineer-in-Chief, PWD detailed various achievements of the Department. Pradeep Chauhan, Engineer-in-Chief, Project, V.K. Bhardwaj, Chief Engineer, Quality Control, K.K. Gupta, Chief Engineer, PMGSY and other Zonal Chief Engineers and senior officers also attended the meeting.